Running costs are reassuringly low thanks to a low-power, efficient engine that provides good fuel economy. 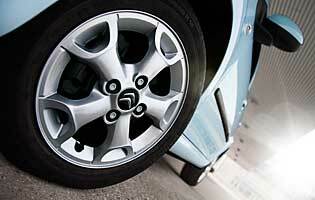 Low weight helps, reducing wear and tear on brakes and tyres in particular. 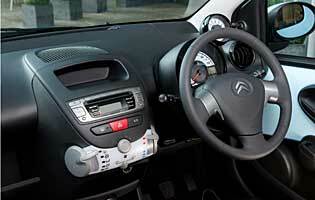 All C1s have low insurance group ratings and impressive CO2 figures that sit very well in the road tax system. The one bugbear is its purchase price, which seems high when compared to some cars from a size class above. An unorthodox 'open glove box' shelf in front of the front passenger seat is at first strange, but then when it becomes clear how useful it is for temporarily holding gadgets, small bags and other oddments it becomes a stand-out interior feature. A large bin in the centre console sits above two cupholders and an open slot at the top of the console is good for books, tablet devices or sunglasses. It's a cabin designed for real-world use by young people. The most obvious quirk in the C1's display arrangement is the rev counter, which is on a stalk to the upper right of the instrument cowl. Basic VT models don't have a rev counter at all, and this arrangement makes it possible to keep the large, circular speedometer exactly the same for all models. Its digits are large enough to read clearly and although it's fairly low-tech it does its job well enough. No particular emphasis has been placed on introducing heavy soundproofing materials and so the cabin is not the most refined or relaxing place to be at speed. Despite this, a commendable ride quality at low speed means that the car is most comfortable in its driving heartland, and the suspension does a good job of absorbing the bumps posed by the raised and sunken manhole covers, potholes and grids of a typical urban space. This model has remote central locking and an immobiliser that requires the correct key in order to allow the engine to start. The one other security feature of note on the VTR+ is a dark tint to the rear windscreen and rear door windows, helping to keep prying eyes out. Security testing company Thatcham rates the C1 as four out of five for preventing theft of the car itself but only one out of five for preventing theft from it. This range-topping model is the only one for which Electronic Stability Programme is even available as an optional extra, leaving an obvious gap in the safety equipment list, but not a crucial one. The C1 has plenty of braking aids to ensure a safe stop in almost any conditions, and a cornering stability system that acts like a watered-down ESP. There are airbags to the front and front sides, while curtain airbags are optional. On top of its undoubted urban charm, where its light weight and excellent visibility make driving a pleasure, the C1 also has tall gearing. This helps to keep engine revs lower for any given speed, but it also means that its reasonable torque-to-weight ratio can provide a surprising turn of pace to the off-beat thrum of the engine. It's adept at the motorway cruise if you so desire, although it can begin to feel out of its depth. It's very unlikely a family would choose this car as their only vehicle, and there are good reasons why not. The boot is one of the main ones, because there simply isn't enough room for child-related paraphernalia like pushchairs, sports equipment or bikes. On the other hand, both rear seats have Isofix industry-standard child seat mounts and the passenger-side front airbag can be switched off for when using rear-facing child seats. While the C1 is the right size for a first car, without too much technicality or power, this model is not quite the perfect choice. At its list price it's an expensive choice and there are two models below it in the range that are less costly. If purchase price is less of a consideration it's affordable insurance rating, cheap maintenance costs and economical engine are all worthy of praise. 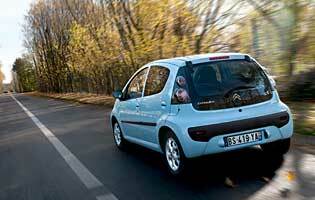 Above all the C1 is very easy to drive. Citroen is among a group of brands that has been suffering with image problems in the run-up to the launch of this car; the sales figures painting a bleak picture. 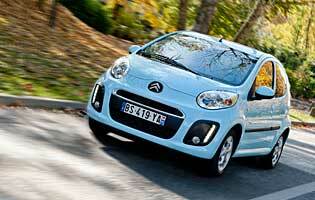 However, the C1's image is young, vibrant, cheeky and most importantly trouble-free. It's a very likeable car and is good for the brand. The material quality of the car is not as high as some rivals', but mechanically and electrically it's very simple and in the event of a fault it's very easy to set right. This five-door model uses its restricted space quota remarkably well, with short, wide-opening doors allowing much greater ease of access than the three-door version. Rear passengers still have to tuck their feet well in to get out because of bodywork intrusions beside the short foot wells, but passengers have little else to criticise here. The boot opening is too narrow between the boot sill and the back seats, however, and restricts luggage access too much. The VTR+ is the only C1 model that comes as standard with the full available mix of audio input channels, including Bluetooth, a 3.5mm auxiliary socket and a USB port. Occupants therefore have maximum flexibility when it comes to choosing how to play their music. It's a simple system that doesn't take long to get used to and use quickly, with a small, old-fashioned orange LCD panel providing the interface. Traditional buttons that need no explanation are dotted around the screen. The C1 is chiefly a young person's car, and there are some suitable bright colours to choose that compliment the car's image better than the selection of blacks, greys and whites, which dull the exterior charm somewhat. The VTR+ benefits from full body-colouring, which helps. The interior trim aesthetics are a low point, with hard, cheap-feeling plastics dominating the view. The centre console in particular is very untidy and almost looks unfinished. If there's one thing the C1 is good at, it's parking. Its small dimensions mean that few spaces are too small whether parallel or bay parking, and its tiny footprint is an advantage in tight car parks. There are no parking sensors but they're not needed on a car this small. A driver can almost reach out and touch the rear window, so judging where the back bumper is doesn't get any easier. Its turning circle could be better, but otherwise it's ideal. Full-size spare wheel fitted as standard. Petrol engine options - 1.0-litre (67bhp). Transmission options: five-speed manual gearbox standard, plus optional five-speed automated manual. Trim levels: VT, VTR, VTR+.